You may have seen a giant bottle of this bitter apéritif with an artichoke on it at the bar and immediately recoiled. A liqueur made with artichokes? I'll get my vegetable fix another way! But give Cynar (pronounced CHEE-nar) a chance. It's popping up on cocktail menus everywhere, so get used to it. It's a trend that's only going to get stronger. If you're a fan of Campari and looking for something new to try, sub this libation into your Negronis. This rich, herbal liqueur can be drunk on the rocks, subbed in for your Campari cocktails, or can add a nice balance to a sweet cocktail. 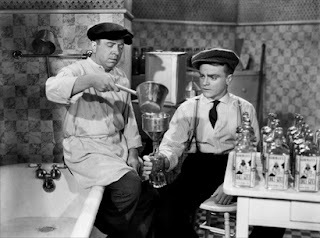 I tend to see it mixed in with a lot of bourbon cocktails, like Matt Biancaniello's Kentucky Bubble Bath at The Roosevelt Hotel's Library Bar in Hollywood, or sometimes with a ton of other bitters like Eeyore's Requiem (Can someone please create a whole bar menu named after Winnie the Pooh characters?) at The Violet Hour in Chicago. So next time you bop into your favorite mixology den, impress your friend by 1) pronouncing Cynar right and 2) picking a cocktail that contains it. I think your mind will be changed about the libation in that funny looking bottle. It's time to hit the pool or the beach. The Lush Chef has once again picked up an over-abundance of peaches from the farmers market that she will not be able to eat fast enough. What's a girl to do? Make sangria, of course. Living in Southern California, I actually drink sangria all year-round with the Lush Chef Taste Testers, and it's almost always the red kind. That summer crop of peaches, however, calls for white wine sangria. Your mother will be proud that you're getting your daily fruit intake too. There's no real science to making sangria - wine, fruit, some other libation like vodka, gin, brandy, cognac, tequila (whatever you've got! ), let it stew for a few hours and you're done. So this recipe is really just a starting point. Feel free to experiment, add your favorite fruits, use whatever cheap wine you can find and finish with any libation you desire. I like to also add fresh herbs to my sangria for added color, so I tossed in some basil. 1 bottle white wine - something light, crisp and fruity like a pinot grigio, riesling, sauvignon blanc. I actually used a moscato I had on hand because I wanted something already sweet and not bother with adding extra sugar. - Combine above ingredients in a pitcher and refrigerate for 2-3 hours. - Serve in a glass over ice. - Preheat oven to 325 and line those muffin tins. - In a medium bowl, combine flour, baking powder and salt. - In a large bowl, cream the butter and sugar with a hand or stand mixer on medium speed until light and fluffy. - Add the eggs one at time, beating well after each addition. - Mix in the lime zest, juice and vanilla. - With the mixer on low speed, add the dry ingredients alternately (in 3 additions) with the buttermilk, starting and ending with the dry ingredients. Beat until just incorporated. - Fill the muffin tins about 3/4 full and bake for 20-22 minutes. - When they're done baking, lightly brush the tops with tequila. - Let cupcakes cool completely before frosting. - Using a hand or stand mixer, beat the butter until smooth. - With the mixer on low, slowly add 2 3/4 cups confectioners sugar until fully incorporated and frosting is smooth. - Add the lime juice, 1 Tbs tequila and salt, and beat until the frosting is light and fluffy. - If you want your frosting boozier, add more tequila. If you need to thicken it up, add more confectioners sugar. - After frosting the cupcakes, garnish with lime zest or wedges. The dip fun continues! Usually when I do a cheese spread, I resort to these wine cheese balls, but I didn't feel like cracking open a whole bottle of wine if I was going to be making everyone cocktails. I had tons of green olives and some leftover cream cheese in the fridge, so I decided to make something dirty martini inspired. I recommend serving this with toast points or toasted bread slices — something not too salty because blue cheese can already be on the salty side. Everyone devoured this dip, so mark this one in the books as a Lush Chef favorite (and original) recipe. - Combine all ingredients thoroughly. Done. - Serve with toast points or crackers. Libations left over: pretty much the whole bottle, so bottoms up! It's dip week at The Lush Chef! I had a cocktail party this past weekend and made a ton of refreshing lavender lemonades and mojitos with lavender simple syrup. I didn't want to spend a lot of time cooking or baking anything for this party, so I did a couple of dips that can be whipped up in no time. This homemade hummus from Kegerators has a touch of Hefeweizen — the liquid helps give it that smoother and creamier texture. Here's to Blue Moon! - Put chickpeas, garlic, cumin, lemon juice, 1/2 tsp of the lemon zest, olive oil and beer into a food processor or blender and purée until nice and creamy. - Add more beer if it's too thick and chunky, and salt to taste. - Serve in a bowl and drizzle olive oil over it and sprinkle with paprika and remaining lemon zest. Go into any LA bar right now and you’ll find cocktails that are like a garden in a glass. Take a sip, and you just might think you’re laying in a field of summer flowers with the sun shining on you. A friend of mine had brought me a few bunches of lavender, and because I was leaving soon for a quick trip, I didn’t want to let it all go to waste. While I do wear lavender oil in my hair (a Lush Chef beauty tip), I wasn’t about to start pressing oil and whipping up a hair product on a Wednesday night. But prepping ingredients for lavender-infused cocktails...well, that I know how to do! Lavender sugar is a fancy way to dress up and give an elegant decor and flavor to cookies and cakes. It also makes a sweet finish to rim a cocktail glass with. Scented sugars also make fantastic and inexpensive little gifts. The Lush Chef likes to put them in little mason jars with pretty ribbons. - Fill a glass jar with the sugar and layer in the lavender blossoms. - Be sure to use lavender meant for culinary use. I recommend buying the organic stuff straight from the farmers market. 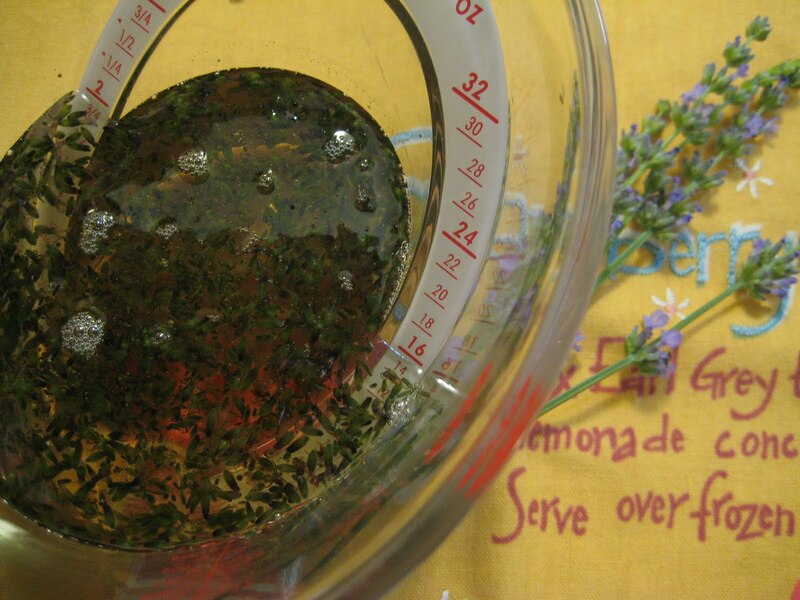 - Shake the jar every few days, and by the end of 2 weeks, you'll have beautifully scented & flavored lavender sugar. - Be sure to run the sugar through a sieve to get all of the blossoms out before using. For some subtly sweet and herbal cocktails, I love using lavender simple syrup. It's a surprising addition for champagne cocktails, makes an excellent boozy lavender lemonade, or gives a French twist to a mojito. This also makes an excellent Lush Chef gift. - Heat water and lavender blossoms to a boil. - Add sugar and stir until completely dissolved. 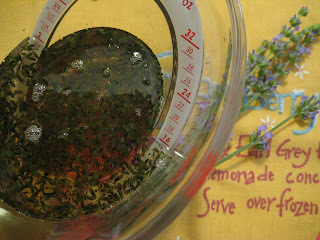 - Remove from heat, and refrigerate for 3 days so the lavender really gets a chance to infuse the syrup. - Strain the syrup to remove the blossoms and bottle it up!